Over the last few years I have started to lose magazines I subscribe to that are delivered by Royal Mail. This month it was Radcom's turn, the April edition didn't show it's face. At least a week had gone by after despatch to the membership. One has to be on the ball, it would be easy for the month to pass and the next month to roll in and the copy might not be missed if I was busy. 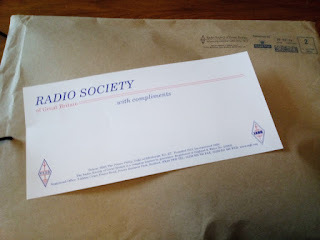 I seem to remember it was about this time last year that Radcom had gone missing, the year before that it was QST, do I have someone snaffling my post? Anyway a quick call to the RSGB office and there was one sent out in a plain brown envelope very quick! But I had missed the window of opportunity for persusing members ads, which you have to be quick if one is on the lookout for a bargain. Steve, G1KQH, is a regular contributor to AmateurRadio.com and writes from England. Contact him at [email protected]. Are you SURE your postman (or postwoman) isn’t a secret Ham??? all too often here in the states. Many times a magazine shows up weeks or months later, dogeared and filthy,with obvious signs of having been read. No way it just “fell behind a counter” as the postal clerks try to get us to believe. I’m down to only a couple of mailed subscriptions. All others are digital.